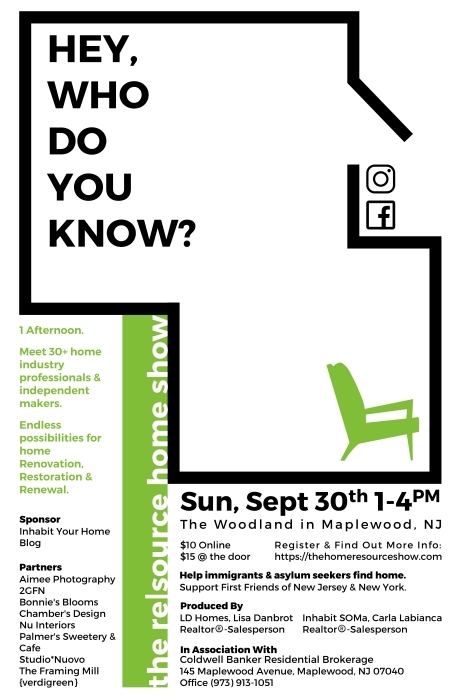 The first annual Resource Home Show will be at The Woodland in Maplewood, NJ on Sunday, September 30 from 1-4. It is the answer to the ongoing call for home industry professionals who restore, renovate, upgrade and maintain our beloved homes. This homegrown event invites you in to meet, greet, and view the work of a variety of local and regional industry professionals including Architects, Designers, Landscapers, Contractors and more. Enjoy an iced coffee while you peruse the 30+ Exhibitor displays. Attend DIY demos in Antique Window Restoration, Annie Sloan Chalk Paint® and Fall Container Gardening. Or simply strike up a conversation in one of our two lounges for Visitors and Exhibitors.